Fachkräfteallianz Region Stuttgart (Stuttgart Region Skilled Specialists Alliance) provides a network for all relevant regional labour market policy stakeholders, bundling their activities and rendering those activities transparent. It also initiates new offerings as needed. The alliance is made up of the state employment agencies in the region, the North-Württemberg branch of the German Trade Union Federation (DGB Nordwürttemberg), the Stuttgart-Region branches of IG Metall trade union, of the regional Chamber of Commerce and of the regional Chamber of Craft Trades, Robert Bosch GmbH, the Südwestmetall employer federation and the Stuttgart Region Economic Development Corporation (Wirtschaftsförderung Region Stuttgart GmbH - WRS). 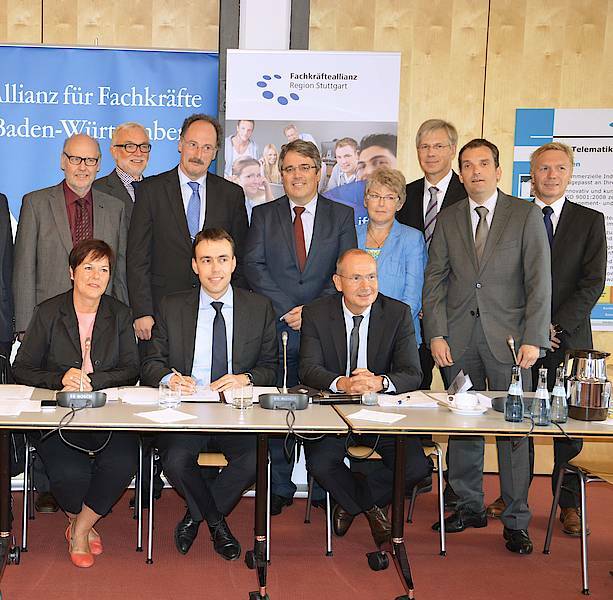 The coordinating body was set up in April 2013 at the Stuttgart Region Economic Development Corporation and is supported by Baden-Württemberg's Ministry of Finance using funding from the European Social Fund (ESF). The Stuttgart Region Welcome Center is a joint project of Fachkräfteallianz Region Stuttgart. The project is being implemented as a pilot under the management of the EDC in 2014 with support from Baden-Württemberg's Ministry of Finance using ESF funding. You can find more information on Fachkräfteallianz Region Stuttgart here. The Stuttgart Welcome Center is located at Charlottenplatz at the institut for foreign affairs. The ifa (Institut für Auslandsbeziehungen) is committed to a peaceful and enriching coexistence of people and cultures worldwide. It is promoting art and cultural exchange in exhibitions, dialogue and conference programs. As a competence centre for foreign cultural diplomacy, the ifa is connecting civil societies, cultural practices, art, media and science. It is initiating, moderating and documenting discussions on the international cultural relations.